Rain is forecast in a few days, and many remaining autumn leaves will likely be swept from their trees. This hasn't been a blockbuster foliage year in the bay area, but I was excited to see oak leaves near their peak on Pinheiro Ridge this morning. I had never been on this ridge, and barely found my way there today. Before leaving the house I printed out a Rush Creek map from the Marin County Parks website. I started as I have every other hike here, on Pinheiro Fire Road. At the junction with Rush Creek Fire Road, instead of continuing around the marsh as I usually do, I headed south on a straight trail between the cemetery and a housing development. 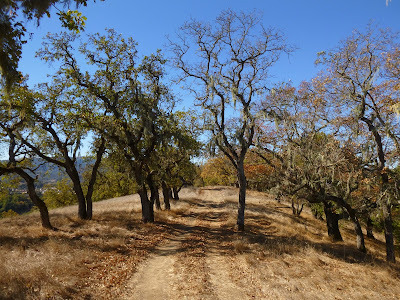 Then, at Bugeia Lane, I turned right and started looking for the path shown on the map, a hiking-only trail connecting the path along the sidewalk with Pinheiro Ridge Fire Road. But I couldn't find the trail. When I got to the intersection with Atherton Avenue, I figured there was no way I could have missed the trail. Instead of backtracking, I turned onto Saddlewood Road and walked along the road (no sidewalks). After a few minutes I noticed a open space sign at a bare hillside on the left, but I was looking for a fire road, and there was no fire road there. A few more minutes down the road and I still hadn't found the fire road. I backtracked and stood in front of the steep hillside wondering where this mystical fire road was hiding. Luckily, I heard voices and a group came down the hill. This is indeed the fire road! 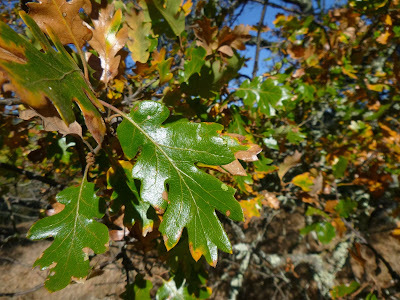 So up I went, through pretty oaks, to the ridgeline, where the fire road is obvious. The deciduous oaks are at their autumnal peak this week, I think, blazing yellow and orange. This is a good place to test your oak mettle -- in addition to evergreen coast live oaks, there are Oregon and black oaks, both of which are gorgeous in autumn. I also enjoyed the views southeast out across the bay to Mount Diablo, and just slightly northwest to Mount Burdell. After a very steep descent on what must have been a social trail, I finished up the hike on 101 Trail. Great exercise on a lovely autumn day. Back at home, I viewed the Rush Creek area using Google Earth, and it doesn't appear that the connector (shown on the open space map) connects anything at all -- it terminates on a hilltop between Saddlewood and Bugeia. Next time I hike here (and I will be back in late winter for the wildflowers) I will connect to Saddlewood from Pinheiro Fire Road (near the cemetery). This loop is about 3.3 miles. Directions to the preserve here on my BAHiker Rush Creek page.